20 MP Camera with Carl Zeiss optics & optical image stabilization. With an octa-core processor and a 5.7” Quad HD display, it’s the most powerful phone we’ve ever built. With USB-C Fast Charging, an extra-large battery, and wireless charging, it’s pure power that’s easy to charge. Demanding apps, serious games, and the creativity tools you love – get a Lumia 950 XL Dual SIM and discover exciting new ways to do great things. The moments you want to remember happen so fast. That’s why we designed a 20 MP sensor that automatically reduces motion blur for sharper, more detailed photos. And with unique features like triple LED natural flash and Rich Capture auto mode, challenging lighting conditions won’t stop you from turning magic moments into precious memories. Connect your Lumia 950 XL Dual SIM to a Microsoft Display Dock and use it with an external monitor, a keyboard, and a mouse. Office apps and Outlook scale up to create a big screen-optimized work environment that makes you more productive. It’s a PC-like experience that’s powered by your phone. 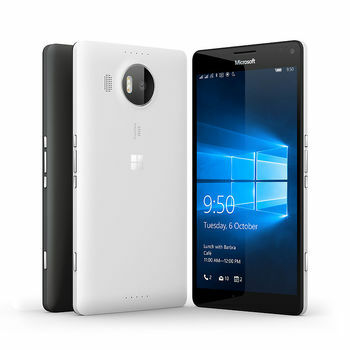 With a stunning 5.7” Quad HD display and a powerful octa-core processor, it’s the Lumia you’ve been waiting for. Get the phone that works like your PC and push the limits of what’s possible. One Windows experience Apps, games, and music are in one place with the brand new Windows Store and Cortana sends helpful reminders to all your Windows 10 devices. Office apps are easy to use on any screen size and Outlook Mail has the same rich editing tools as Microsoft Word. From Excel to entertainment, Windows 10 keeps your digital life in sync across devices. Superior performance With an octa-core processor and a 5.7” Quad HD display, it’s the most powerful phone we’ve ever built. With USB-C Fast Charging, an extra-large battery, and wireless charging, it’s pure power that’s easy to charge. Demanding apps, serious games, and the creativity tools you love – get a Lumia 950 XL Dual SIM and discover exciting new ways to do great things. Fantastic photos The moments you want to remember happen so fast. That’s why we designed a 20 MP sensor that automatically reduces motion blur for sharper, more detailed photos. And with unique features like triple LED natural flash and Rich Capture auto mode, challenging lighting conditions won’t stop you from turning magic moments into precious memories. Windows Continuum Connect your Lumia 950 XL Dual SIM to a Microsoft Display Dock and use it with an external monitor, a keyboard, and a mouse. Office apps and Outlook scale up to create a big screen-optimized work environment that makes you more productive. It’s a PC-like experience that’s powered by your phone.